NEW YORK and CHICAGO; Nov. 5, 2015 – As today’s business-to-business (B2B) buyers are increasingly adopting digital throughout every stage of the customer journey, expecting engaging, seamless, and consistent experiences across touchpoints, suppliers struggle to weave everything together into a coherent omni-channel strategy, according to new commissioned research byAccenture (NYSE: ACN) and SAP hybris (NYSE: SAP). The global study of 2,000 B2B buyers and sellers – titled “Mastering Omni-Channel B2B Customer Engagement – was conducted by Forrester Consulting on behalf of Accenture Interactive, part of Accenture Digital, and SAP hybris. It finds that business buyers’ expectations for personalization and excellent support – regardless of channel, device, or stage in the journey – are rapidly evolving, influenced by their experiences as consumers. For instance, more than half of buyers said they would like suppliers to offer personalized recommendations across interactions. However, most B2B enterprises are not set up to deliver a seamless omni-channel experience, citing “difficulty sharing customer data between channels or locations” as the top barrier. B2B buyers turn to consumer sites. Even when B2B customers aren’t buying online, they are researching via digital channels, with 98 percent of buyers doing at least some online research on work-related purchases that they make offline. Most begin their research using either consumer marketplaces, such as Amazon or eBay (33 percent), or search engines (26 percent). Traditional B2B online destinations declined significantly from last year, with brand manufacturers’ websites down 19 percentage points and distributor websites down 16 points. Online is the most popular channel for purchases. Forty-four percent make purchases via web, mobile or tablet more than half of the time. The study also points to the declining role of the sales representative, with only 20 percent of buyers purchasing directly from a sales rep more than half of the time. Phone or email customer service lagged at 17 percent. 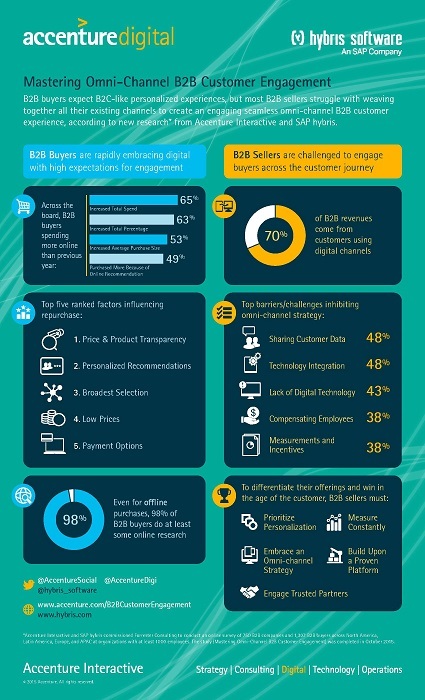 B2B buyers are crossing channels throughout the buyer journey. Thirty-eight percent of buyers exclusively use digital channels, while 32 percent mix online and offline channels. The study found that B2B buyers not only desire – but expect – a seamless omni-channel buying experience. And, sellers are listening. “Meeting customer expectations” was the top driver for investment in omni-channel (74 percent, up from 66 percent last year). Sellers cited “to provide a consistent customer experience, regardless of channel” as the second-most driver (65 percent). B2B sellers are rising to the challenge by ramping up their omni-channel investments. Providing a consistent, cross-channel customer experience was cited by sellers as not only a top commerce initiative, but their top company initiative overall. To read the full results of this study, visit: accenture.com or hybris.com. For the study, “Mastering Omni-Channel B2B Customer Engagement,” commissioned by Accenture and SAP hybris, Forrester Consulting conducted an online survey of 750 B2B companies (sellers) and 1,307 B2B buyers across North America, Europe, Latin America and Asia-Pacific at organizations with at least 1,000 employees. The study’s objective was to evaluate B2B buyers and their online experiences and how B2B sellers are leveraging platforms and technologies to address the growing demands of B2B buyers. The study was conducted from August to September 2015. For more information on this research, register here for an upcoming webinar with Accenture, SAP hybris, and featuring Forrester, on December 8 at 11:00 AM ET/16:00 PM GMT/17:00 PM CET. Accenture is a leading global professional services company, providing a broad range of services and solutions in strategy, consulting, digital, technology and operations. Combining unmatched experience and specialized skills across more than 40 industries and all business functions – underpinned by the world’s largest delivery network – Accenture works at the intersection of business and technology to help clients improve their performance and create sustainable value for their stakeholders. With more than 358,000 people serving clients in more than 120 countries, Accenture drives innovation to improve the way the world works and lives. Accenture Interactive, part of Accenture Digital, helps the world’s leading brands drive superior marketing performance across the full multichannel customer experience. Accenture Interactive offers integrated, industrialized and industry-driven digital transformation and marketing solutions. To learn more follow us @AccentureSocial and visit www.accenture.com/interactive. SAP hybris provides omni-channel customer engagement and commerce solutions that allow organizations to build up a contextual understanding of their customers in real-time, deliver a more impactful, relevant customer experience and sell more goods, services and digital content across every touch point, channel and device. Through its state-of-the-art customer data management, context driven marketing tools and unified commerce processes, hybris has helped some of the world’s leading organizations including 3M, ASICS, Bridgestone, EE, Galeries Lafayette, Johnson & Johnson, Levi Strauss & Co, Nestlé, Nespresso, Nikon, Rexel, Samsung Electronics, Ted Baker, Tommy Bahama and W.W. Grainger, to attract, retain, and grow a profitable customer base. hybris Commerce Suite, hybris Marketing and hybris Billing sit right at the heart of SAP’s customer engagement and commerce (CEC) suite of solutions, alongside SAP® Cloud for Sales, SAP Cloud for Service and SAP CRM. These provide organizations with the foundation, framework and business tools to create a holistic customer view across channels, simplify customer engagement and solve complex business problems. For more information, visit www.hybris.com.